The Boeing 737-800, carrying 157 passengers and eight crew from China's coastal city of Xiamen, managed to touch down close to midnight amid a downpour after aborting an initial attempt to land due to poor visibility, according to Philippine officials, who expressed relief that a disaster was avoided. The airliner lost contact with the tower as it rolled off the runway into a rain-soaked field, where one of the plane's engines and wheels got ripped off before everyone onboard scrambled out through an emergency slide, the officials said. A Filipino-American from California, Ruben Lopez Espinas, thought the plane would crash. "I surrendered myself. I said, 'Lord, I am yours if it's really my time,'" he said. Chinese passenger Wang Xun Qun embraced her teen daughter during the tense moments before the aircraft landed. When asked to describe their experience, the two repeatedly said, "Scary, scary." Chen Lei, who was on the plane with friends, said the plane touched down but pulled up steeply in a 90-degree angle a few seconds after it aborted the first landing. "My palm started to sweat," he said. When it did land, the plane glided for about five seconds then the wing and the engine under it hit the ground, with Chen witnessing the unfolding danger from a window. "The luggage fell down and many equipment inside the plane started to fall. I also smelled heavy smoke," he said. 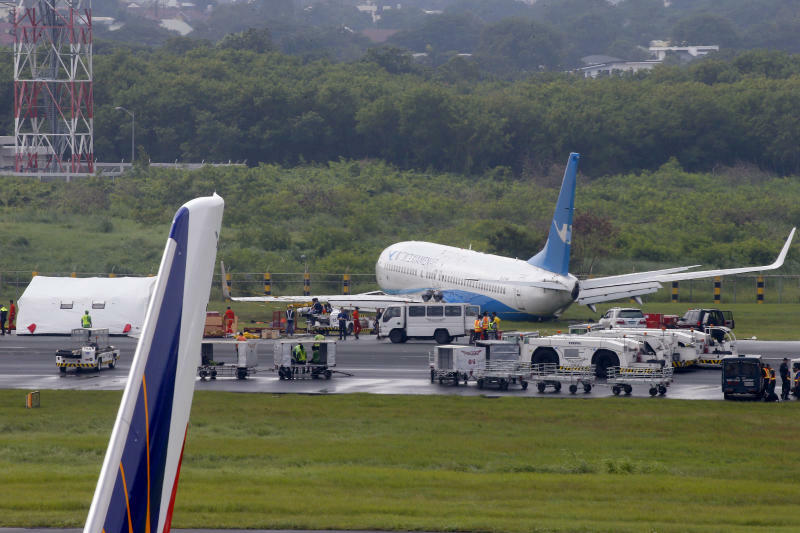 "With God's blessing, all passengers and the crew were able to evacuate safely and no injuries except for about four who had some superficial scratches," Monreal said. The plane failed to land at first apparently due to poor visibility that may have hindered the pilots' view of the runway, Director-General of the Civil Aviation Authority of the Philippines Jim Sydiongco told reporters. The plane circled before finally landing near midnight but lost contact with the tower, Sydiongco said. 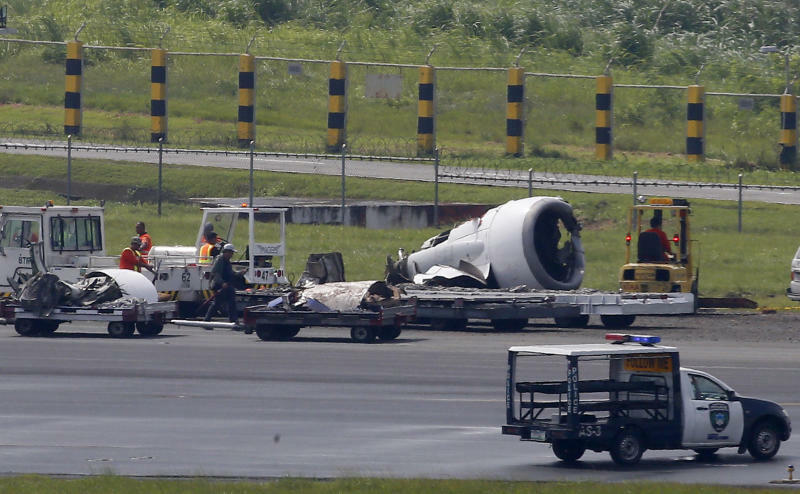 Investigators retrieved the plane's flight recorder and will get the cockpit voice recorder once the aircraft has been lifted to determine the cause of the accident, Sydiongco said. 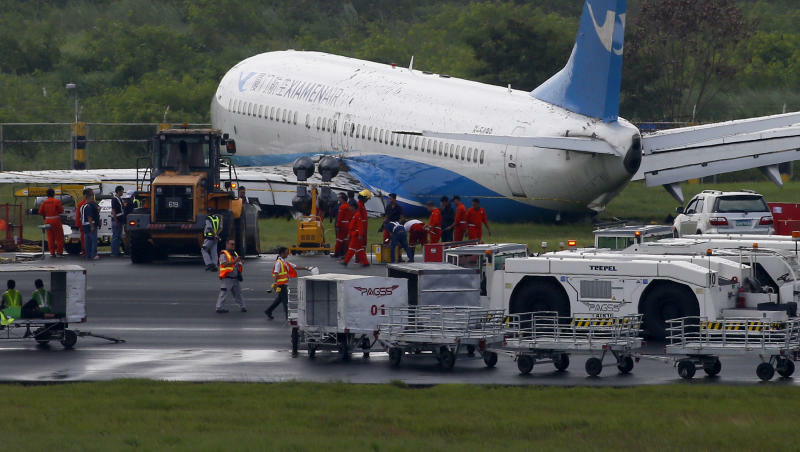 Ninoy Aquino International Airport, Manila's main international gateway, will be closed until Saturday morning while emergency crews use a crane to try to lift the aircraft, its belly resting on the muddy ground, away from the main runway, officials said. A smaller runway for domestic flights remained open.